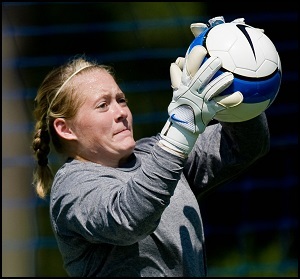 Kelsey, simply known to most in the soccer world as “Wally”, was one of Dynasty Goalkeeping’s first students. She has overcome numerous challenges in her career; becoming a starter at a D1 college as a smaller 5’5 goalkeeper, finding a way to play professionally despite playing at a smaller lesser known D1, a successful transition from player to Physician’s Assistant, and overcoming a massive scare with a brain aneurysm! I have always appreciated Wally’s outlook, passion, and never ending commitment to becoming her best self. I think you will enjoy learning more about her journey! You were one of Dynasty’s first students attending camp in our second year (2007) what initially drew you to Dynasty? How many years did you attend as a student? My first experience with Tracy was as a camper at UNC. I really enjoyed her style of coaching and felt like we had a good rapport. I received a flyer invitation to Dynasty camp the first year it took place but I was unable to attend due to Club soccer commitments. That December I was with my mom at the College Cup and when we were leaving one of the NCAA Final Four games I saw Tracy walking the other direction. My mom encouraged me to say hi. I was too nervous, unsure of myself and didn’t think she would remember me but my mom yelled out “Tracy” and there was no turning back. We got to talking about Dynasty camp and I made up my mind then that I had to go. Her enthusiasm for training goalkeeper and pushing them to the next level was what I needed before going into my first season at TCU. 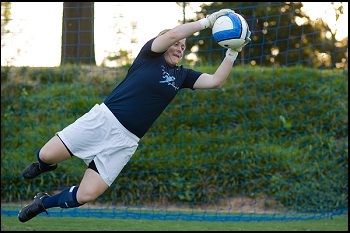 I gained the confidence and drive to push myself to be the starting goalkeeper my freshman year. ultimately helped me improve my game. Her encouragement and honest assessment of my abilities gave me the confidence to pursue my dreams. As a student I would say the goalkeeper community. I have never experienced a community as encouraging, competitive and driven as Dynasty goalkeepers. There is a wide range of experiences that come into camp. We learned from each other and pushed each other to improve. As a staff coach I’d have to say the late nights laughing with you, working on video or getting ready for the next day. How did your experience at Dynasty help you with the transition from youth to college soccer? The staff was amazing and had experience playing at the highest level. It was great seeing how they trained. The strength and conditioning sessions were a great benefit that other camps I had been to didn’t have. You grew up in Oklahoma, why did you choose to attend TCU? Also, at your height you were not the typical top prospect, how were you able to overcome the perceived height challenge? I played for a very competitive club in Oklahoma. 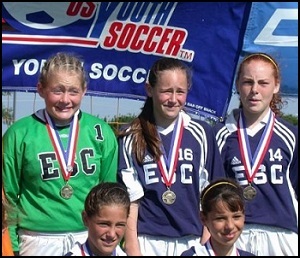 We were in the USYSA Final Four twice and in the Region 3 finals all but one year. This was a huge advantage when it came to recruiting but I think my height (5’5”) was a hindrance. I remember one coach specifically calling one of my references to discuss my height. I had a strong vertical (22”) and good timing so I was confident in my ability to cover the goal and challenge on corners/crosses. I chose TCU for several reasons. First, they had a new coach who wanted to make the program competitive and compete for NCAA title. Second, two of my club teammates had already committed to play there. Third, it was close yet far enough away from home. Fourth, I felt that it would be a good fit academically. Finally, I wanted to be on the field and I was confident I could win the starting job. early. I had not been given any conditioning packet like is typical before the fall season. I struggled daily to catch up. I dreaded conditioning days. Dynasty camp helped me turn a corner and push through. I still struggled but my mentality changed. My first season I struggled in class because I was not used to missing so many days. We had mandatory tutoring which helped but I had to learn discipline in regards to study habits. High school had been so easy for me that I never needed to study and didn’t know how. It took some time to adjust and they had a ton of support for student athletes. My freshman year I had a shutout against Utah who was ranked at the time. It was Senior night and we were projected to lose the game. I had 10 saves with one being a PK. We won the game 3-0. Purple Heart Award 2008-2010: After each game the team took a vote on who had the most impact on the game. At the end of the season the person with the most was given the Purple Heart plaque. You were also a staff coach at Dynasty Goalkeeping for several years, what was that experience like to go from student to staff coach? I worked Dynasty camps 2008-2010. It was the highlight of every summer. The transition from student to staff was natural and I was honored to have been asked. I wanted to maintain the quality of staff that had been there when I was a camper. 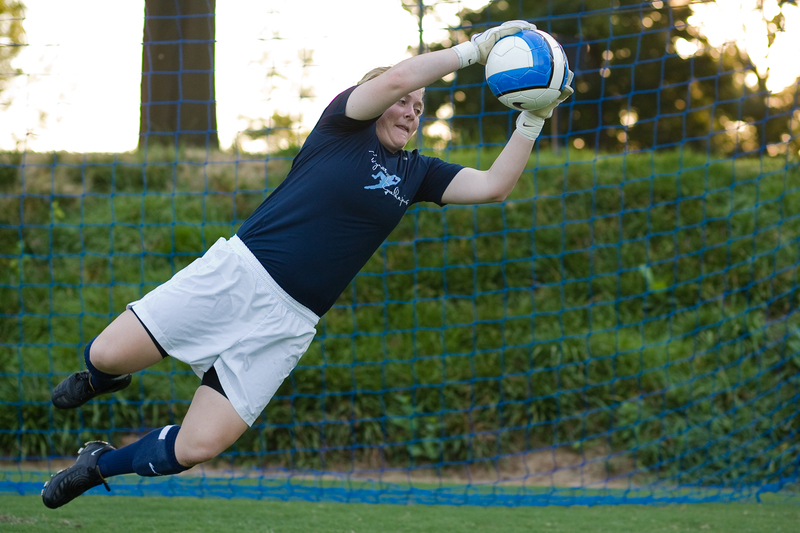 It pushed me to be a better goalkeeper in a different way than being a camper had. After college you had the opportunity to play professionally in Iceland for three seasons. Share with us how you came upon that opportunity and the challenges you encountered just to get there and also while you were there. What was daily life like as a “professional” player in Iceland? Beyond the soccer experience gained, why else did you find this experience worthwhile? How did this experience playing abroad help you beyond soccer later in life? I played in Iceland for three summers, 2011-2013. The first two summers I played on a team in 1st Division (which happens to be the lower division behind Pepsi league). I was provided housing, transportation (bike/bus 1st year and car 2nd year), and a job as a goalkeeper trainer and assistant coach. I loved being able to play there but felt that the level wasn’t as high as I would have liked. The people were amazing and I wouldn’t trade the experience for anything. In 2013 I hadn’t planned on returning to Iceland and was playing in the WPSL at home. A friend from Iceland came for the summer and played in Oklahoma. Just before she was going to return to Iceland she heard about a team in the top “Pepsi” league who needed a goalkeeper. I got in contact with them and in a few days they booked my flight and I was headed back. There was a clear difference in the competitiveness between Pepsi league and 1st division. In retrospect I could have negotiated for more benefits but did not have an agent or know what my options were. That said I would do it again in a heartbeat with or without the benefits. I would say the Pepsi league is similar to high level D1 play. Going to Iceland helped me break out of my shell. I’ve always been somewhat shy and tentative but traveling to another country and not knowing a soul made me be more outgoing. It gave me confidence in myself in dealing with new situations. 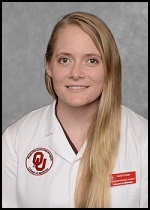 After retiring from soccer you went back to school to become a Physician’s Assistant. What made you decide to enter this field of work? 2013 was my last season. In the fall/spring between going to Iceland I worked as a goalkeeper trainer at Hill junior college, Nolan Catholic HS, and UCO while taking pre-requisites for Physician Assistant school. I started PA school in June of 2014. It is a 2.5 year program. I chose to be a PA because I have always been interested in medicine and helping people. One perk of being a PA is you can change specialties at any time. Another plus is it only took about a month to find a job after graduation! What are your current job responsibilities? What are some of your daily challenges? I currently work with an Orthopedic surgeon. We travel to several satellite clinics and operate 3 days a week. I have my own schedule and see patients on my own under his supervision. I evaluate/examine patients, interpret x-rays, make treatment plans, and schedule patients for surgery on clinic days. In the OR, I assist in whatever capacity my supervising Doctor sees fit. I close incisions and splint patients after surgery. I follow up on patients that are in the hospital. I love the variety. I am not stuck in one place every day. One of my personal daily challenges is dealing with the few patients who are not motivated to recover. They want a quick fix and aren’t wiling to put in the effort required to rehab from an injury. I wish I had a magic wand, but I don’t. What do you find most fulfilling about your position? What excites you about going to work each day? The most fulfilling thing about my job is making a difference in someone’s quality of life. Whether it be a steroid injection or figuring out why they are in pain and coming up with a solution. Another thing I love is the sports teams we take care of. We work with hockey and rugby teams, and take care of an entire junior college athletic department. Having the chance to work with athletes and get them back in the game is very rewarding. You have had to overcome a MAJOR medical condition in the past few years having a scare with a brain aneurysm and then needing a subsequent brain surgery. Can you share with us some of the details? 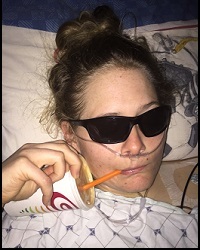 I know you were in the hospital for a LONG time, what was the recovery like and how were you able to overcome this massive health setback? 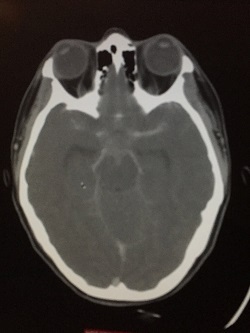 The blood from a subarachnoid hemorrhage shows up white on a non-contrast CT.
On Dec 13, 2015, during PA school clinical rotations, I suffered a subarachnoid hemorrhage from a ruptured aneurysm (an artery in my brain leaked blood where it is not supposed to go). I don’t remember much from that night but my husband said I had the worst headache of my life and he convinced me to go to the ER. On the way down our apartment stairs I lost consciousness. He caught me before I could fall down the steps then called 9-1-1 and waited for the ambulance. Subarachnoid hemorrhage is fatal 40% of the time with 15% dying before they reach the hospital. Of those who survive, 66% are left with some neurological deficit. The odds were not in my favor. 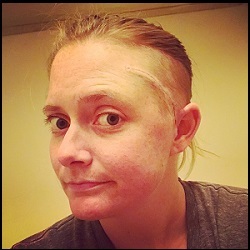 I was admitted to Neuro ICU and had my aneurysm coiled the next day. I had to stay in the ICU for 18 days and 3 more days on the stroke floor. While there I had 13 CTs of my head and 3 angiograms (going through my femoral artery to inject dye into the arteries of my brain) to make sure everything was okay. Physical Therapy didn’t get me up and walking until Dec 26 (13 days later!) so I was very weak and could only take a few steps, but within a few days I was doing laps around the ICU! I had incredible physicians and nurses taking care of me. My family rotated shifts and made sure someone was with me 100% of the time. I was in denial about how close I had been to death, but it was a different experience for my family. I was determined to get back to school. I took one month off all together. My husband took a month off and helped me get back to a normal activity level. Amazingly I recovered fully with zero deficits. Where did you find the courage and mental strength to overcome the fear of having another aneurysm? What impact has that had on your outlook on life? Have you made any significant changes due to this experience? What perspective have you gained through this experience? Looking back, I don’t feel as though I made a conscious choice to overcome anything. In my mind it was the only option. I didn’t want to let anything slow me down from my goals. After this experience I really do not take life for granted. I feel like I got a second chance and all my days after Dec 13th, 2015 are bonus days. This June I had my follow up angiogram to check my aneurysm and the coils. The Interventional Radiologist who did my coiling said that I would now require an aneurysm clip because it had continued to grow and was at risk for re-rupture. It was terrifying. The coiling was not an open procedure but the clipping would require a craniotomy. Overall, things went perfect. I was back to work in two weeks and didn’t have any setbacks. How did your career in soccer prepare you for your transition into the ‘real-world’ beyond soccer? Soccer had a HUGE impact in my life. It gave me self-confidence and taught me the value of hard work. I learned how to function as a part of team as well as be a leader. Soccer teaches most of the skills employers are looking for. I want to continue to be involved in PA education by mentoring students and having them rotate with me. I really enjoy teaching and have had 3 students so far. After I gain more experience I’d like to give a lectures for the PA program. Also, my husband and I are hoping to start a family in the future.